Could A Hedge Fund Manager Trying To Short Stocks Of Pharma Companies With Bad Patents Derail Patent Reform? A few months ago, we wrote that it looked like much needed patent reform had stalled out in Congress, despite expectations that it would fly through Congress easily this year, having the strong support of both the majority party in Congress and the President. And this year, unlike last year, the trial lawyer lobby wouldn't be able to intervene. Of course, the one big obstacle -- as with every time patent reform is proposed -- would be the pharmaceutical industry. But even that seemed like it shouldn't be a huge problem because nearly all of the (relatively mild and fairly weak) reforms proposed really targeted trollish behavior, using overly broad patents to shake down innovative companies. Whether or not you approve of the way drug companies use patents, the trolling issue is a bit outside of that industry's concern, and thus it was believed that while pharmaceutical companies might whine a little bit, they wouldn't really stand in the way. Let's unpack that a little. The "IPR" process stands for "inter partes review" and it's a process by which anyone can try to challenge a bad patent, by presenting specific evidence that it shouldn't have been granted because of prior art. This process is somewhat useful in helping to get the Patent Office to toss out some bad patent claims that it never should have approved in the first place. It's a fairly limited process too. You can file for an IPR, but the Patent Trial and Appeal Board (PTAB) will only take up the effort if it decides "there is a reasonable likelihood" that it will invalidate the claims based on the submitted material. In other words, it's a pretty high bar to cross, and anyone filing frivolous IPR claims won't get very far at all. Now, back to Kyle Bass. He's been making news in the last few months by filing for an IPR against pharma patents, while simultaneously shorting the stock of the pharmaceutical firms that hold the patents. He's set up an entire organization to do this, called the Coalition for Affordable Drugs. Kyle Bass, head of Hayman Capital Management LP—which made a fortune wagering on the housing bust—is targeting patents that he says have little value other than to drive up prescription drug prices. His new fund bets against companies whose patents it believes are spurious, and invests in those that would profit if the patents are invalidated, said people familiar with the matter. His latest challenge seeks to employ a relatively new and inexpensive petition process to invalidate a Jazz Pharmaceuticals PLC patent for Xyrem, a narcolepsy drug with sales of $779 million last year, two-thirds of Jazz’s 2014 revenues. Mr. Bass created the Coalition for Affordable Drugs, an organization that is the lead petitioner in several patent challenges filed with the U.S. Patent and Trademark Office. He says he plans to pursue the cases regardless of share price moves. “We will not settle,” he said in an interview. Celgene attorneys made this point in a June 3 email to the patent office. But there was more. They also alleged that his coalition threatened to challenge Celgene patents “unless Celgene met their demands.” Those demands weren’t specified, but the email states that “when Celgene did not pay,” the patent challenges were filed, according to the patent office order, which cited the email. And, using this whole story, to argue that the whole IPR process is a disaster, the pharmaceutical industry is trying to revamp and effectively destroy the entire (important and useful) IPR process. And while it seems likely that Bass's efforts are much more about enriching himself via the stock shorting than actually making drugs more affordable, arguing that his efforts somehow undermine the entire IPR process is a stretch. Indeed, as noted earlier, there are built-in protections that make it rather inefficient for anyone to really abuse the process the way pharma companies are portraying. Again, the special board in the Patent Office, the PTAB, has the ability to just outright reject any IPR petition it doesn't think has a chance of surviving. 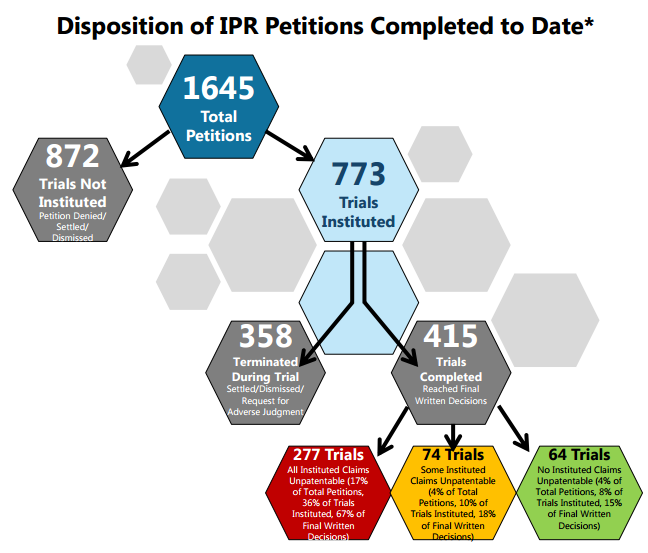 And, in fact, a recent report by the Patent Office shows that (1) less than half of all IPR requests result in actual challenges and (2) even then, the vast majority of claims being challenged are actually allowed to stand. 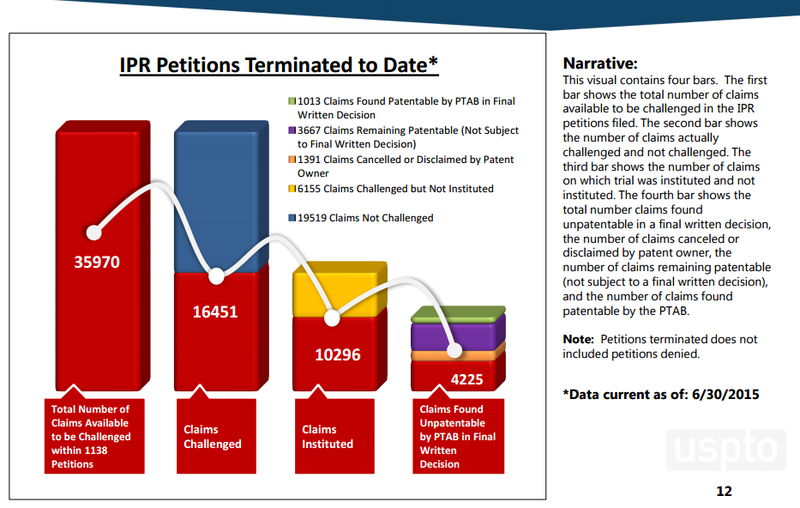 As of the end of June of this year, you can see that the PTAB rejects most petitions, many more are "terminated," and of those that go to a full trial, many retain patentable claims that were challenged: Even more to the point, if you look at the total number of claims actually challenged, against those that end up being found unpatentable, it's a fairly tiny number: only 4,225 claims out of were challenged. That's less than 12%. Hell, even if you look at just those claims that the PTAB initiates proceedings on, less than 25% of them are invalidated. In short, the idea that the IPR process is making it easy to simply kill off good patents is not even remotely supportable. Instead, it appears to be doing what it's intended to do: make it more reasonable to help people kill off bad patent claims. If pharma firms are worried about what Bass is doing, it should only be if the patents they have are questionable in the first place. If they're legit, they won't pass the laugh test, and the whole process won't get anywhere. And yet... because the pharma industry just doesn't like having to deal with Bass at all, it's trying to destroy the whole IPR process, saying that's the only way that it will support the other aspects of patent reform. But undermining IPR would do serious damage to patent reform as a whole, and take away a key tool that actually does work in more quickly invalidating crappy patents. Whether or not you approve of the way in which Bass is doing what he's doing, the process isn't really open to abuse in a manner that should raise any real concern. And, for everyone else, the IPR process remains an important element in stopping abusive patents. Keith Mascus. “Incorporating a Globalized Intellectual Property Rights Regime Into an Economic Development Strategy.” Ch. 15 of Intellectual Property, Growth and Trade. (ed. Mascus). Elsevier. 2008. Kamal Saggi. “Intellectual Property Rights and International Technology Transfer via Trade and Foreign Direct Investment. Ch. 13 of Intellectual Property, Growth and Trade. (ed. Mascus). Elsevier. 2008. Alexander Koff, Laura Baughman, Joseph Francois and Christine McDaniel. “Study on the Economic Impact of ‘TRIPS-Plus’ Free Trade Agreements.” International Intellectual Property Institute and the U.S. Patent and Trademark Office. August 2011. TRIPS-Plus IPRs viewed as “important, but not essential” for attracting investment. Many other factors matter (taxes, human capital, clustering, etc). Many countries had recently changed laws to comply with TRIPS, so changes for FTAs had a smaller effect on investment. The way in which the obligations were implemented was important. It is not wise to simply impose one legal framework on top of another. Implementation of FTAs requires taking specific nations’ legal systems into account. In general, the results show that stronger IPRs were not correlated with changes in FDI. They were correlated with changes in licensing, but not always in the direction one would expect. The data does not show that stronger IPRs required by FTAs drove significant amounts of tech transfer in these three countries. There are plenty more studies along these lines. At what point do we stop taking it on faith that expanding intellectual property laws is automatically good for the economy and innovation and start looking at what actually works?